Vermicomposting is increasingly being adopted by businesses, institutions, farms, and municipalities for managing organic waste. 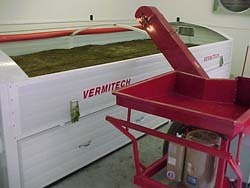 Organic materials can be vermicomposted on-site or transported to a centralized facility. Businesses that generate food waste include restaurants, grocery stores, hotels, food processors, nursing homes, wholesale food outlets and farmers markets, shopping malls, resorts, and offices with dining facilities. U.S. businesses generate 25 million tons food scraps, unrecyclable paper, and cardboard annually (EPA 1999). At least 74% of restaurant waste is food and paper (EPA 1999). Institutions generating food waste include hospitals, schools, universities, prisons, military bases, long-term care facilities, and government centers. The U.S. EPA estimated in 2006 that 35-45% of the waste generated in the United States was by schools, businesses and institutions. Farms are vermicomposting manure and crop residuals. Farmers are choosing to vermicompost for several reasons. Some need an environmentally-beneficial alternative for manure management. Others want to produce vermicompost to increase their crop yields and reduce their use of fertilizers, herbicides and pesticides. And some farmers choose vermicomposting to increase their income from sales of earthworms or vermicompost. Municipalities can vermicompost food residuals, yard debris, or sewage sludge. They can operate vermicompost facilities on their own or contract with a private entity. For example, a private business used to contract with two municipalities in Pennsylvania to vermicompost their sewage sludge. One factor of feedstock throughput in vermiculture is based upon the number of earthworms you have. Eisenia fetida consume about 25 – 35% of their body weight per day, depending on several factors including temperature, moisture, humidity, and the pH, salinity and ammonia levels in the feedstock. The quantity of earthworms is measured in pounds; there are approximately 1,000 Eisenia fetida per pound (~500 if they are all adults; ~2,000 if they are all juveniles). Feed the earthworms a thin layer of feedstock that is no deeper than one inch. After they have consumed all of the food, then apply another one-inch layer. Consumption rates will vary, as sometimes the earthworms may consume all of their food in one day and at other times it will take two or more days to eat the food. Building a Sustainable Business: A Guide to Developing a Business Plan for Farms and Rural Businesses focuses on helping alternative and sustainable agriculture entrepreneurs. Published by the USDA’s Sustainable Agriculture Research and Education (SARE) program, the guide’s sample worksheets illustrate how real farm families set goals, determined potential markets and evaluated financing options, and helps the reader develop a detailed business plan. To preview, this publication is available online in a 277 page pdf file. See http://www.sare.org/publications. Print copy order information is also provided. Each wire-bound copy is $14 plus $3.95 s/h. Credit card and discounted volume orders may be placed by calling 802/656-0484. Controlling Mite Pests in Earthworm Beds Sherman, R. and Bambara, S. 1997. NC State Extension. AGW-001. Suggests five methods for removing mites from earthworm beds. Cornell University’s Vermicompost Research – This site contains a lot of research papers on the effects of vermicompost on a variety of plants and the 9-minute video Vermicompost: A Living Soil Amendment. Herbicide Carryover in Hay, Manure, Compost, & Grass Clippings: Caution to Hay Producers, Livestock Owners, Farmers & Home Gardeners Davis, J., Johnson, S.E., and Jennings, K. 2015. AG-727W. NC State Extension. 6 p. Certain herbicides can remain active in hay, straw, grass clippings, manure, and compost (very important information!). Large-Scale Organic Materials Composting Sherman, R. 1999. NC State Extension. AG-593. 16 p.
Potential Markets for Vermiculture and Vermicomposting Operations (Rhonda Sherman, Vermicomposting News – No. 6, Feb. 2001). Raising Earthworms Successfully Sherman, R. 2016. NC State Extension. AGW-641. 26 p. Describes the conditions necessary to raise earthworms depending on the business market the grower chooses to pursue. Small Business Development Centers in North Carolina – They give advice–for free–on how to start a business, finance a business, manage a business, research markets, write a business plan, do an industry analysis, utilize the internet, etc. United States Small Business Administration – They give advice–for free–on how to start a business, finance a business, manage a business, research markets, write a business plan, etc. Locate Small Business Development Centers in your state. Vermicomposting Gains Momentum Rhonda Sherman, BioCycle, Oct. 2010.